I didn’t order this dish (bf did) and it looked very yummy! Nothing too special about it though. The negatives is that bacon (a lot of the pieces were quite burnt), but those scrambled eggs and mushrooms look very nice! It was a pretty big serving as well. When there’s a lot of competition out there and the taste of the food is around the same (give or take good/bad days) what makes A LOT of difference is the service. Unfortunately it didn’t live up to my expectations (that feeling of being unwelcome isn’t a nice one, and yes I’m always mindful it could be a one off thing but it’s happened twice in a row already :/). Don’t worry it wasn’t so awful that I dislike the place, I’ll still come back (for those Egyptian Eggs – REALLY enjoyed it). 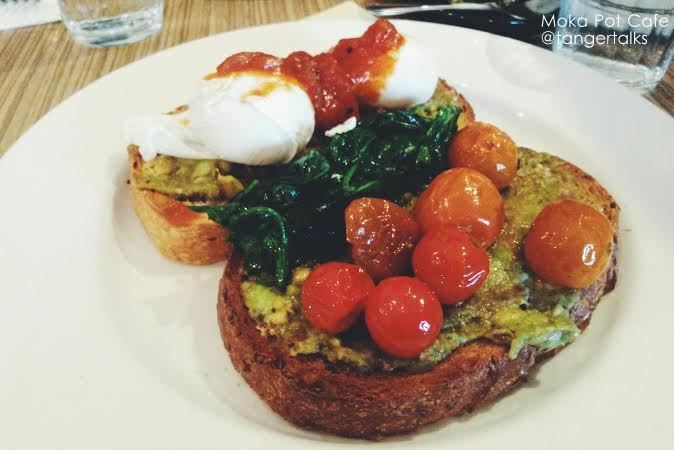 This entry was posted in Food & Noms w/ Tanger, Ramblings w/ Tanger and tagged big breakfast, brunch, cafe, foodie, happy, health kick, healthy, i love food, iffy, melbourne foodie, Moka Pot, moka pot cafe, poached eggs, quality time, rant, review, scrambled eggs, seriously, service, talking about ingress, tomato, urbanspoon. Bookmark the permalink. Thanks for taking the time to post your detailed review of Moka Pot Cafe. We value all feedback we receive, both in-house and online. We are sad to hear that your experience was less than perfect. We’ve taken on board your comments and we hope that the next time you visit us, you won’t be left disappointed.